Pleasure Point is a world renowned surf location on the northern Monterey Bay in Santa Cruz County. During Prohibition the speakeasies gave the area the name Pleasure Point. Through the development of the surf culture, this area has been a place of distinction along the California coast. Pleasure Point has been the home and training grounds for many great American surfers, including Peter Mel, Jay Moriarty, Robert "Wingnut" Weaver and Flea Virostko to name a few. The early big wave rider Fred Van Dyke and the inventor of the wetsuit, Jack O'Neill, are historic figures associated with this area. Almost every weekend I look at this beautiful view of Pleasure Point. I've painted it several times. I've tried different compositions and color palettes. It's been a challenge to paint. I like the warm tones of this view at sunset. 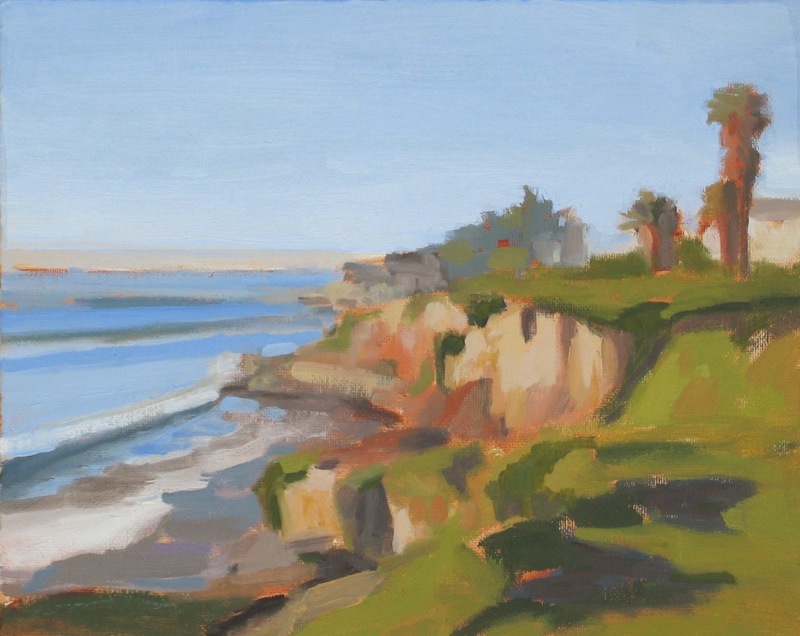 A couple of weeks ago I made a quick trip to Ventura to paint for two days with my friend Chris Beirne. We were lucky, it was sunny in Ventura, so we spent the day from 9:00-5:00 painting at the beach at Surfer's Point. Although the water temperature is around 62 degrees at this time of year, there were quite a few people on the beach and in the water. "Obviously tourists" as Chris said. Locals would only be in the water with a wetsuit this early in the summer. 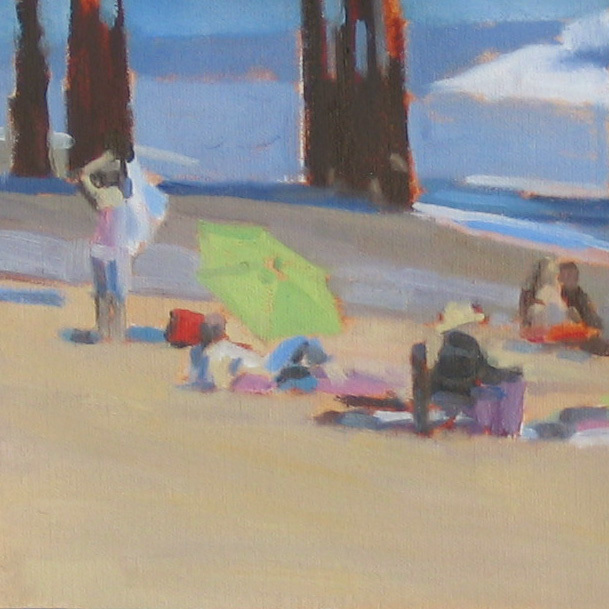 This painting is for the 50-50 show in August at the Pacifica Art Center, my theme is "Endless Summer." Pacific Heights offers panoramic views of the city, with all streets leading to the San Francisco Bay. I want to paint large street scenes of San Francisco, so I'm practicing with small paintings to try out different compositions. Not all small paintings make good large paintings, but it's the best way to start. 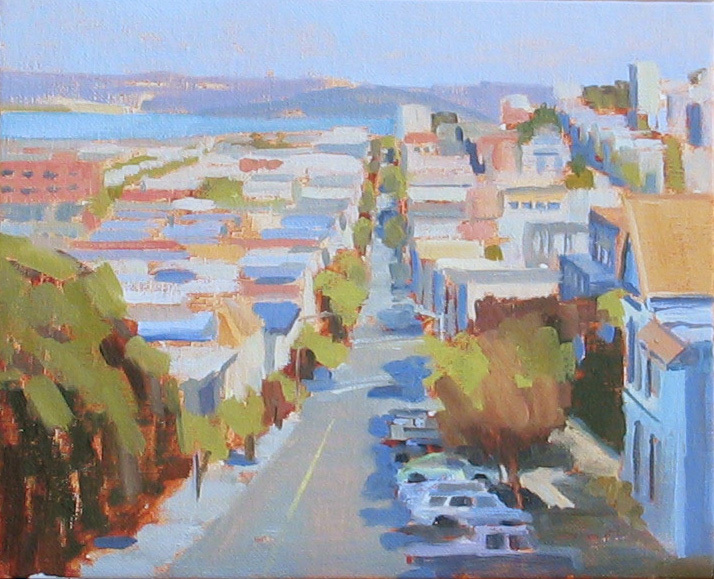 Last week I was chosen to participate in an exhibition at the Sanchez Art Center in Pacifica, CA. The show is called "50-50 Show III." 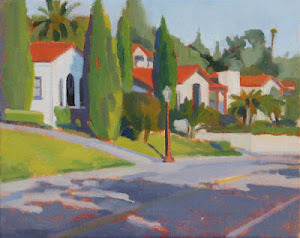 Each artist will paint 50 small 6x6 inch paintings in 50 days and then exhibit the paintings in August. My theme is "Endless Summer," so expect to see some beach scene paintings during the next couple of months as I prepare for the show.